I have mixed feeling about the film so im not to sure what I will speak about just yet,. 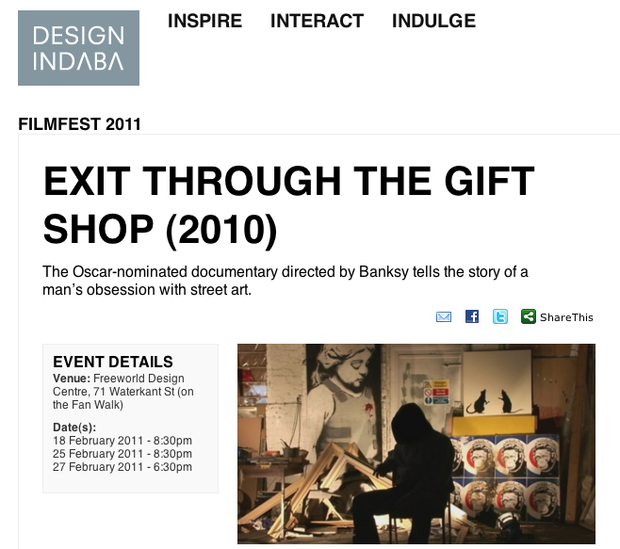 “The Oscar-nominated documentary directed by Banksy tells the story of a man’s obsession with street art. The film charts his constant documentation of his every waking moment on film, from his cousin, the artist Invader, to a host of street artists, especially Shepard Fairey and Banksy. “Subversive, provocative and unexpected, Exit Through the Gift Shop delights in taking you by surprise, starting quietly but ending up in a hall of mirrors as unsettling as anything Lewis Carroll’s Alice ever experienced,” wrote the LA Times.